Cat’s Eye Talisman | Ehsunia | Vaidurya | Talisman Power. Comments There is something distinctly surreal about the phenomenal gems. It’s as if they are alive. The energy is overwhelmingly there waiting to initiate its magic! 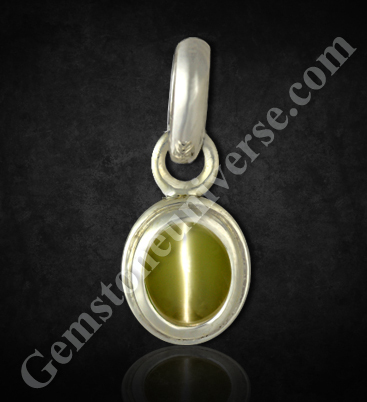 Featured today is a honey gold color chrysoberyl cat’s eye gem from Sri Lanka, of 1.85 carats set in sterling silver as a pendant! Phenomenal gems are essentially those gems that exhibit a peculiar phenomenon in response to light- change in angle, its nature or intensity. The chrysoberyl cat’s eye gem is known for its chatoyancy – a phenomenon in which, the silk like inclusions forming bands across the gem that appear to open and close just like the eye of a cat! Cat’s eye also known as Lehsunia or Vaidurya is used to harness the power of Ketu or the Dragons anti node or the South node of the moon. The planet Ketu, during its dasha or sub periods can lead to periods of intense difficulty and unusual discomforting changes in life. Although these are thrown in for spiritual evolution, much relief can be got through wearing of a natural consecrated cat’s eye talisman. 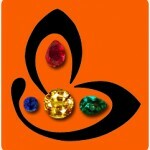 It should be a gem worn for life if ketu is placed in the ascendant house of the individual.